Dave Mattson had the opportunity to buy into an established business but was unable to secure the funding he needed. After being rejected by several bankers and taking a hit to his self-esteem, he thought all was lost. But without his knowledge, Dave’s parents put everything they had on the line for him. Dave Mattson grew up in Simsbury, Connecticut, born into a single-income family as the eldest of four boys. The boys were raised to believe that they could have anything their hearts desired – as long as they paid for it. As a result, Dave grew up as a worker – shoveling snow in the winter; delivering papers and mowing lawns in the summer. As he grew older, he hired on to pick tobacco, since that was the only job he could find that 14-year-olds could legally be hired for. In high school Dave worked three jobs and eventually started his own painting company, which he managed for 6 years and eventually sold when he graduated from the University of Connecticut. During this period of his life, Dave learned the value of hard work, how to deal with people from all backgrounds, the importance of talking about and dealing with money, and the trials and tribulations of being an entrepreneur. Dave has taken this experience and learned how to connect the dots in a conversation, and developed the ability to relate the unrelated. As an introvert, he doesn’t have the need to dominate conversations, choosing instead to listen more than he speaks. This has served him well in both management and selling. He brought his extraordinary work ethic to Sandler. He is known as an over-preparer, and has developed a knack for understanding people, and knowing what they need to become successful. Over the years, he has learned that people love to edit, not create – so he shows up with ideas and encourages others to beat them up and make them better, while simultaneously gaining buy-in. Mattson joined Sandler in 1988, learning under his mentor and company founder, Dave Sandler. Since that time, he has authored several programs, started the firm’s global consulting and training group, created its national branding program, and risen from COO, to partner, to owner of Sandler (2012). He has expanded Sandler into 31 countries, with over 250 training centers. He tries to impart to everyone he meets that hard work pays off, it’s important to be transparent in every facet of your life, and the key to success to getting people to work with you, and not for you. 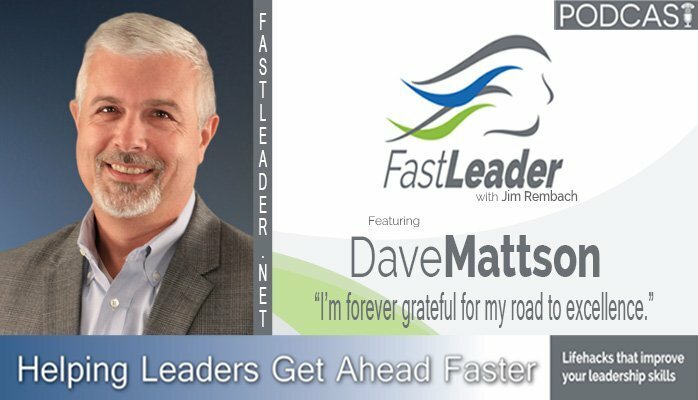 Dave is the author of The Road to Excellence: 6 Leadership Strategies to Build a Bulletproof Business and currently resides in Phoenix, Maryland (a suburb of Baltimore), with his wife and their five children. He was a founding member of Susie’s Cause, in support of the fight against colon cancer, and enjoys fishing, time at the beach, and travelling with his family. Continually looking backwards. It’s holding us back a little more than I think it should. Inclusion. Make sure that people are clear, their on-board and you give them the ability to succeed. I create playbooks for everything we do.